If you visit many Italian restaurants, this soup might be a special on the menu, and you’ll often hear it pronounced “pasta fazool.” Pasta e fagioli (pasta and beans) is a soup-type dish you can easily make at home. This pasta recipe is inexpensive to put together, hearty and delicious! Pasta e fagioli was known as a “peasant dish” in Italy because it was a filling meal that was an inexpensive pasta recipe to make with easy-to-come-by ingredients. That’s the charm of this dish, along with its versatility. Use an assortment of veggies — whatever is on hand works! Add any small-sized pasta you have, or even break up spaghetti to make small pieces. Perfect as a main ingredient in a Meatless Monday meal, beans are high in protein and fiber and low in fat and cholesterol. Beans are considered legumes (and so are peas, lentils and even peanuts) and make a good replacement food for meats due to their nutritional content and great texture and flavor. Q: Do I need to worry about getting enough protein on Meatless Monday? A. No. Protein deficiency is very rare, even in full-time vegetarians. As long as you’re eating enough calories to maintain a healthy weight and following the USDA’s healthy diet guidelines, you’re almost certain to get enough protein. Pasta e fagioli is a great source of protein for your diet and perfect for a Meatless Monday meal! In a large stock pan over medium-high heat, add the olive oil and the onion. Allow the onion to cook until it is tender (about three minutes). Add the tomato (or marinara sauce) and garlic and incorporate it into the mixture. Cook for just one to two minutes (be careful not to burn the garlic). Add the vegetable stock, water, salt, pepper and red pepper flakes. Bring this to a boil and then add your pasta. Lower the heat and allow the pasta to cook until it’s about 3/4 of the way finished (still slightly firm). Add your beans and allow the mixture to continue cooking until the pasta is fully cooked (about 10 to 15 minutes). Add the parsley toward the end of your cooking time. Taste and adjust the seasoning as needed. Serve in individual bowls with extra parsley as garnish and sprinkle with the Parmesan cheese. 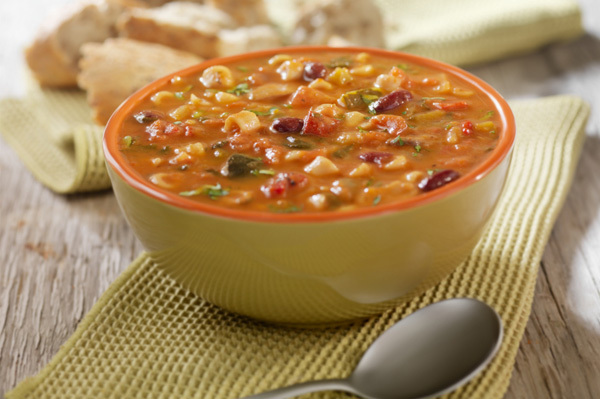 Meat-free recipes like pasta e fagioli make a Meatless Monday meal easy!